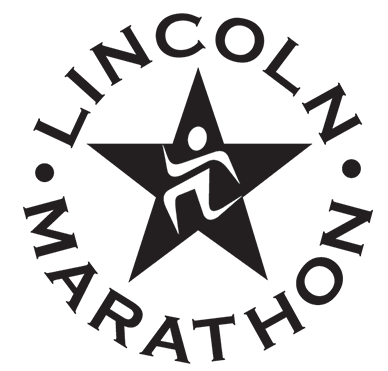 When one thinks about marathon running, they might not immediately think Lincoln, NE. 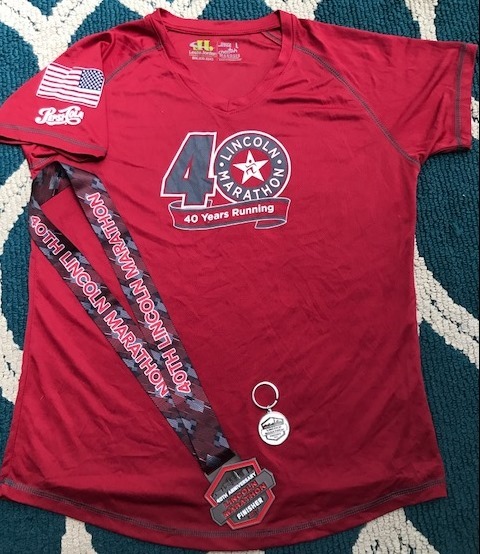 But Lincoln is certainly thinking about marathons and the Lincoln Marathon strives to bring the best possible marathon & half marathon to approximately 13,000 runners each and every year. 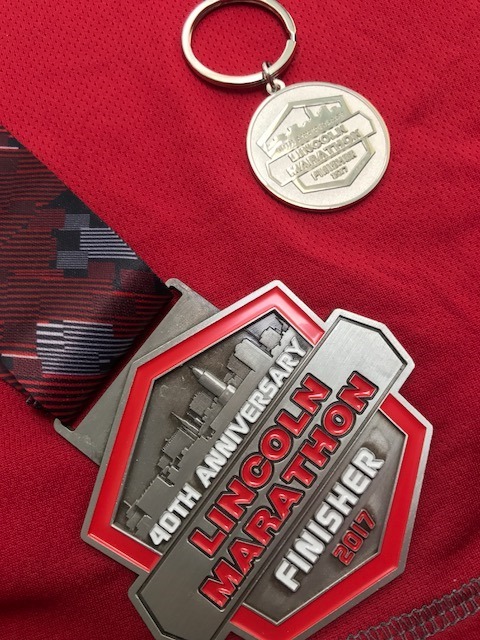 The 2017 Lincoln Marathon was held Sunday, May 7th. This was a quick trip. Timing with Track & Baseball was tight. I might have gotten up at 3am to drive to Lincoln in order fulfill Mommy duties and still run the race. Maybe. Uust Maybe. I didn’t know much about the town of Lincoln. I certainly didn’t know that Nebraska was the birthplace of the Rueben Sandwich (Fun Fact #1) or we would have eaten a Rueben while visiting! The expo was held at the Cornhusker Hotel in downtown Lincoln. Medium sized expo. Great size for the amount of runners. Organized. Fun booths. Easy in and out. Fun Fact #2 – Lincoln NE is the birthplace of the 911 emergency system that is now commonly used across the US. Race day arrived & we had detailed maps regarding downtown parking. Parking was plentiful and ranged in prices from metered parking to covered garages. We quickly found a spot a couple blocks from Memorial Stadium & we were headed to the start line with plenty of time to relax & hit the potties. Lots of potties here, thanks, Lincoln! The stadium was amazing, even empty. 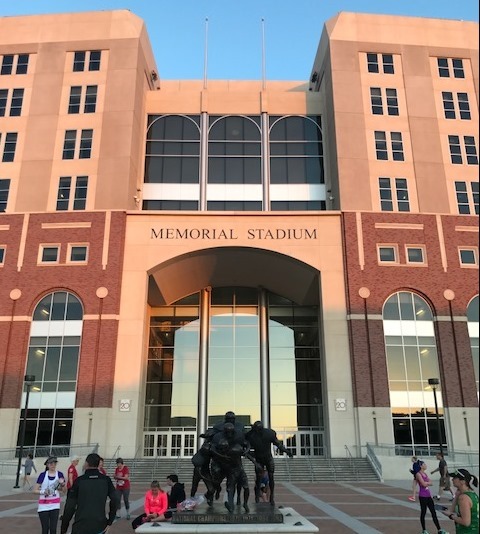 However, I have now heard so much about Memorial Stadium that I wanted to share this pic, image source HERE. Filled to capacity, the stadium will hold 90,000 spectators. Go BIG RED! The race started on time. The National Guard was visible & present. Fun Fact #3, there are 5 army forts open to the public in Nebraska. The armed forces have a real presence in Lincoln & throughout Nebraska. The race was no different. There was a special division just for National Guard members. 117 members finished the marathon & 5 finished the half, many in full gear with loaded packs. And this doesn’t include those who volunteered time & helped with the race. The course was pretty easy without a lot of turns, which is always our preference. It is described as flat. There are some rolling hills in Lincoln. Nothing crazy but if you come from Chicago or NE Indiana, yeah, there are some hills, total of 502 ft of elevation gain. We passed by the Capital Building shortly after hitting the first mile. I’m not sure if it wasn’t visible or I didn’t notice. I was fighting myself mentally & physically for a good portion of the race. I was trying to trick myself into believing it was going to be a great day. It was a great race. And I felt good. So I spent a decent amount of time in my head trying to move my body forward, even though I wasn’t remotely recovered from the hills & heat that Nashville threw my way 8 days earlier. But I wish I had seen the capitol so I could take a photo. Fun Fact #4 – Nebraska is the ONLY state that doesn’t have 2 houses in their legislature. 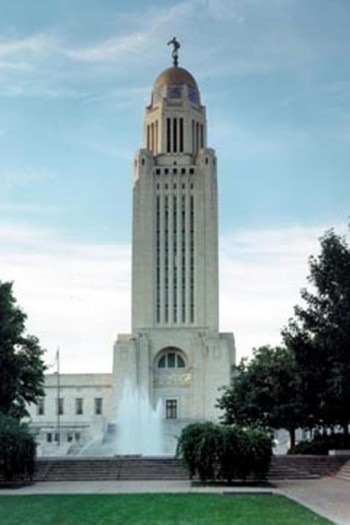 The norm is for a House & Senate but in Nebraska, they are unicameral & nonpartisan. The legislature has 49 senators & is the smallest legislature in the country. 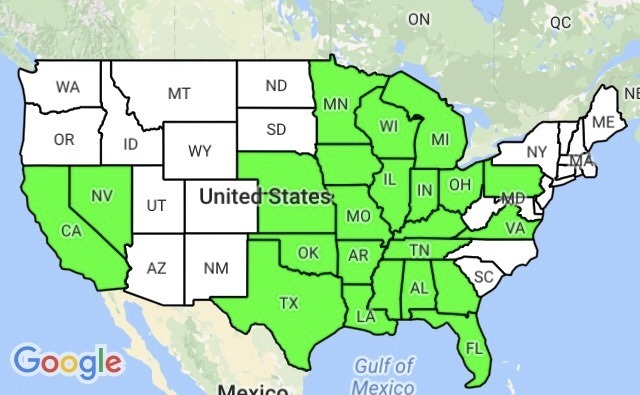 Even Alaska has more members than Nebraska! Source. Stock photo of the Capitol Building below. 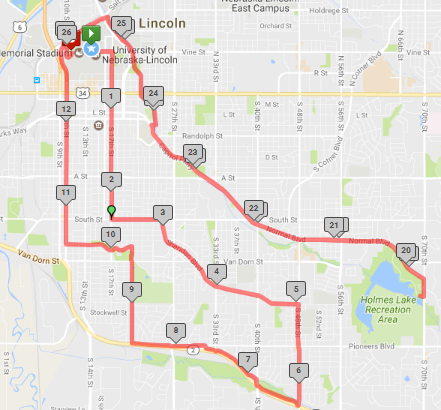 We ran thru town, turned on Sheridan Boulevard around mile 3, passed thru the vicinity of Memorial Park & the Lincoln SE High School at mile 4, then hit 48th Street, passing Union College, until it connected with the Helen Boosalis Trail. The trail was crowded but still lined with spectators and supporters. I remember seeing a lot of dogs throughout the course & I think I high-fived more kids in Lincoln than any other race. The kids were out in FULL FORCE to support the runners! Lots of signs. My favorite was a women holding a sign that said “Motivational Sign”. Wow. Creative or not? Still thinking on that one. Fun Fact #5 – Charles Lindbergh moved to Lincoln, NE in 1922 to learn to fly airplanes at the Nebraska Aircraft Corporation Flying School. 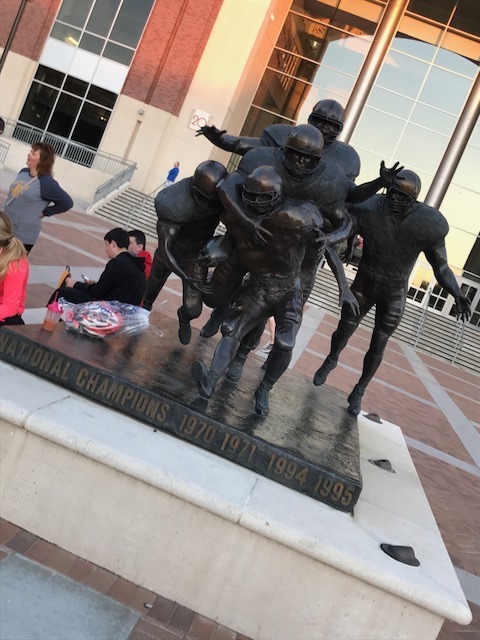 We left the trail around mile 8.5 & headed up 20th Street to Irvingdale & Rudge Memorial Parks, then jogged over to 10th Street for a straight shot back to Memorial Stadium where we dropped the half marathoners at mile 13. This greatly thinned the crowd & started the marathoners on an out & back portion for the final miles of the course. It was heating up by the time we dropped the half runners and aid stations were a little further apart than I like when its hot. Fortunately, we had a nice breeze, it was beautiful day & the aid stations were well stocked & had lots of friendly volunteers when we got to them. 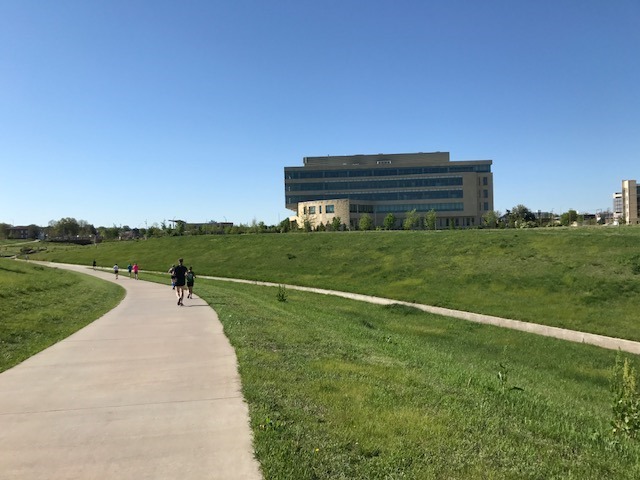 After passing the stadium, we jumped on the Rock Island Trail (photos below) and ran the backside of campus to connect to Capitol Boulevard & Normal Avenue which was the course for our “out”. Once we hit Capitol Boulevard, we saw the Lincoln’s Children Zoo! This was a highlight for me & we passed it at mile 16 & again at 23. After the Zoo, we headed to the turnaround at Holmes Lake Park (approximately 19.6). The “out” stretch was long but it was flat, we had some shade and a little bit of a breeze. But it was long. Really long. My pace slowed considerably in this section. Fun Fact #6 – Lincoln NE is the home of the National Museum of Roller Skating. After the turnaround, we were headed toward the finish. We knew exactly what to expect. We knew where the aid stations were & how long until we could get ice. And we picked up the pace by quite a bit. Splits don’t look that impressive because of the amount of time that we needed to spend at aid stations for cooling & hydration purposes but we were moving pretty well between aid stations. And one of the stats that came up in our finish results were the number of people we passed between mile 20 & the finish. 90 people! 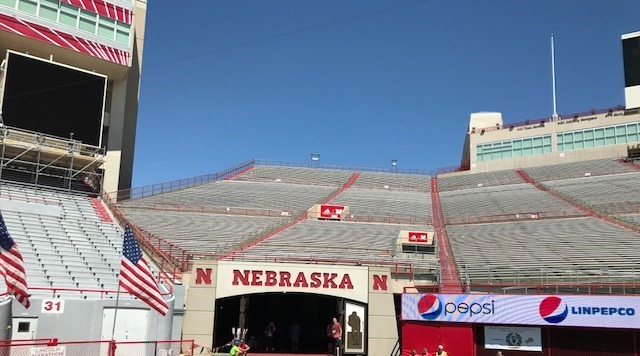 The finish in Memorial Stadium was really awesome too. I really enjoy finishes in big stadium’s like this one. Nice race, Lincoln. SWAG: Nice gender specific shirt in a v-neck, finisher’s medal & finisher’s key chain. All commemorating the 40th anniversary of the event. Overall a good race. Not as exciting on the “sites” as some that we have done but it was organized & done well. 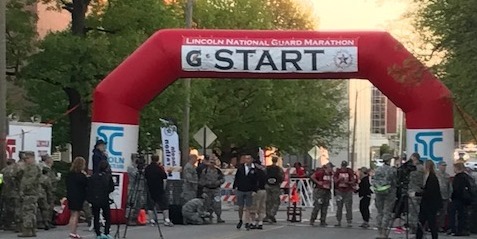 Excellent support from the volunteers, National Guard, local police & spectators. Excellent start & finish in and around Memorial Stadium. And the lilacs were in bloom which always makes me think of Grandma C.
Finisher Stats: 1050 marathon finishers, 9121 half marathon finishers. 81 degrees “feels like” temp at the finish line. Fun Fact #7 – Kool-Aid was invented in 1927 by Edwin Perkins of Hastings, NE. Nebraska is done. That’s officially 23 states in the done column. I’m hoping I can finish my quest to run a marathon in every state by the time I’m 50. I’m 43 now but a lot of the states that we still need are ones which require airfare. That means more $$ and in turn pushes out the time frame. But it’s a long term goal and that’s what I like about it. No pressure. No rush. Just grab the states as we are able. Its FUN. And that’s what running & fitness is to me. Fun. A way to connect with friends. See sights that I would never see in a million years. Like really, I can’t imagine why I would have traveled to Lincoln NE had it not been for the Lincoln Marathon. It’s an adventure. One day, one state, one race at a time …. and whatever happens in between. 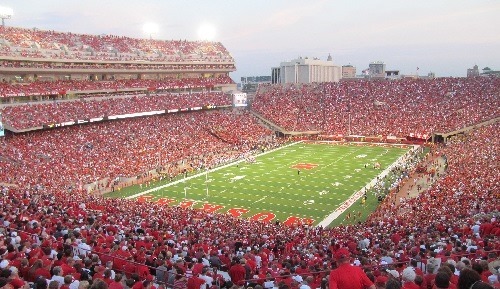 The sources for the listed Nebraska facts, as well as additional info/facts can be found here or here or here or here. Enjoy! 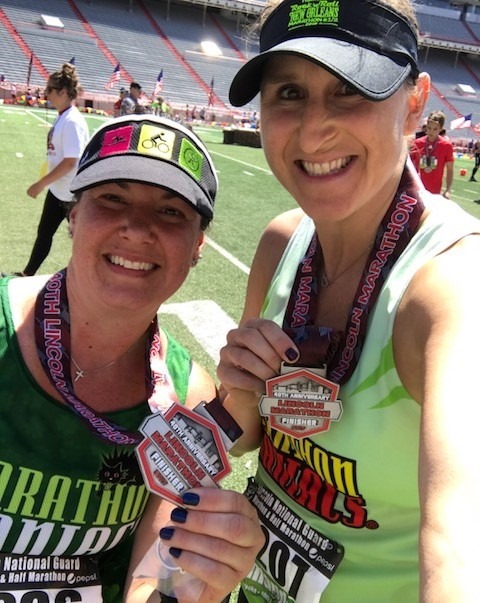 This entry was posted in Fitness, Race Reviews, Running and tagged Fun Facts about Nebraska, Lincoln Marathon, Lincoln NE, marathon in Nebraska, Marathon Maniac, Memorial Stadium, Run Nebraska, Runner Girl, Running by tootallfritz. Bookmark the permalink. Looks like a great race! Nebraska is truly a unique state with a lot of history and I was born there. Go Huskers! Awesome TTF. Love the fun facts! I got my sight on Lincoln when comes time to run NE i hope you don’t expect marathon to feel easy after thrashing out 26.2 in heat of Nashville! Rte 66 Tulsa had that runners passed stat, at least when I ran it. You way ahead of me…I only have 17 states with recent Big Sur. 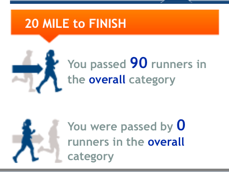 But I do have 9-straight Boston Marathons! Keep up the posts on your races…love it so much! And we are also home to Arbor Day (Nebraska City) AND Center Pivot Irrigation! And Runzas!!! Sorry I did not know you were coming to my home town! I would have held up signs for you and met you at the finish line!!! 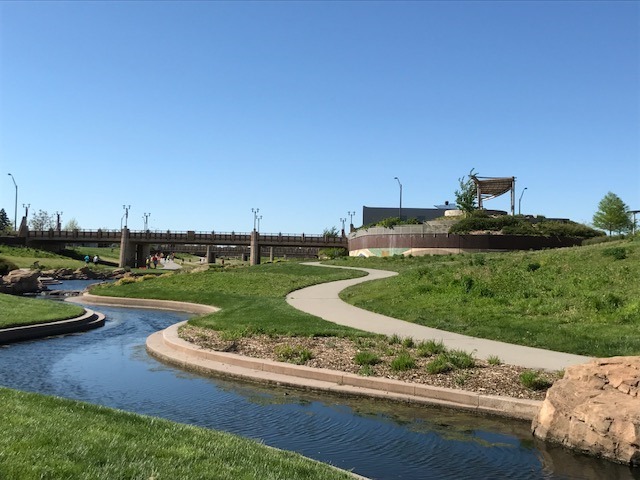 That rock island and antelope creek trail that you ran are two of my favorite bike paths!! I may teach Nebraska History here. The foundation of genetic research also began here (appropriately with corn). :-). And the beginning of our modern judicial system too!